The good people over at Dremel sent their newest tool, the Velocity VC60, for us to give a spin. As someone who just moved into a new-old house, I jumped at the chance to let this small-but-mighty combination tool show me everything it could do. The Dremel Velocity VC60 is the power tool that bridges the gap between traditional oscillating tools and rough-cutting tools, such as reciprocating saws and circular saws. The Velocity tool allows you to tackle larger jobs that other traditional oscillating tools can’t. With a powerful 7.0 AMP motor, an integrated control foot, 5 degrees of oscillation angle, and a newly designed, patented drive system, users can now feel confident about making long and accurate cuts quickly in a variety of materials. Velocity is a two position tool; with the control foot open, the tool is great for making long, accurate cuts in panel materials, and with the control foot closed, the tool is a high-powered traditional oscillating tool optimal for any cutting, scraping, sanding, grinding or grout removal application. The Velocity is an ideal tool for professional remodelers who want a fast-cutting, low dust tool to get through a variety of materials for any indoor job, such as a bathroom or kitchen remodel. It’s also great for the home owners who want one tool that does it all, rather than spending money on multiple tools to cut plywood, drywall, conduit, PVC pipe, 2 x 4 and tile backer during home repairs. 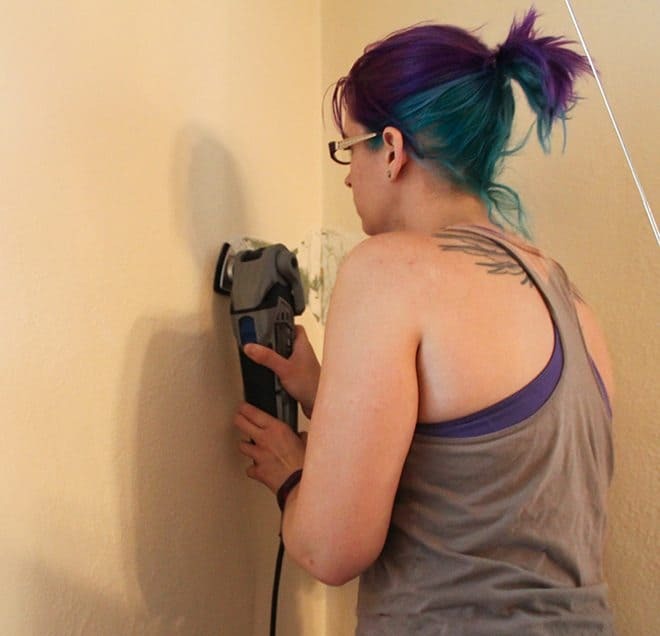 I’m planning on testing every last angle of what this miniature monster can do, but first up on my to-do list was the simple task of tackling a rough spot on the plaster wall corner in my living room. The previous home owners had installed a shelf, and proceeded to paint and replaster a handful of times without removing the shelf. After excavating the shelf from the wall without causing too much damage, then spackling up the divots and drill holes, it was time to break in the Velocity. With a 7.0 AMP motor, it’s no lightweight hand power tool. The roughly 4.5 lb weight of the tool wasn’t lost on me as I unboxed it and set it up for sanding. However, once I turned it on and made contact with the wall, the oscillating portions of the tool made it incredibly easy to manage. The quiet motor would rate, to me, to be lower than your average hair dryer, but still noticable in a room with a TV or other background noise. My kids were in the room and complained more that I had to move our television (that they were watching) in order to reach this awkward spot than they did for either the sound or the dust from the actual sanding. 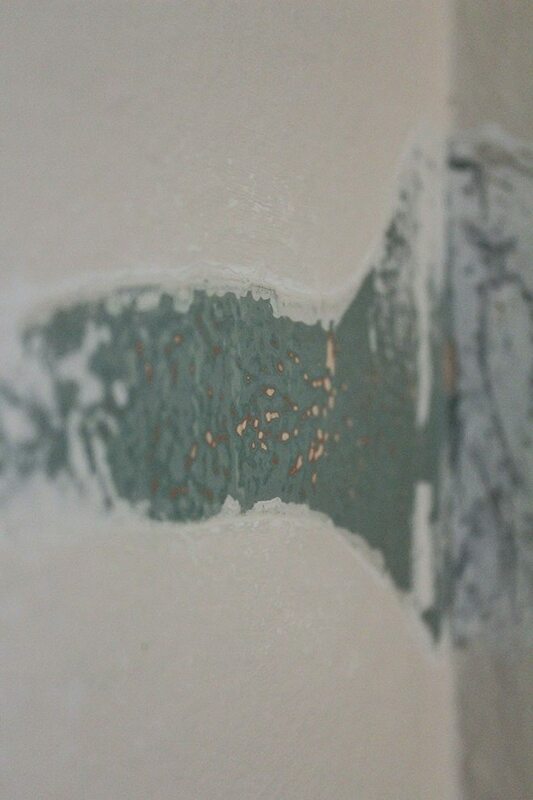 In a matter of minutes, not only were the rough edges of my spackle job smooth and clean, but the rougher outline of paint and plaster that surrounded the former shelf were also blended into the textured relief of the wall. What I was most impressed with is that it didn’t wreck the existing plaster texture — the speed and pressure of the Velocity was certainly enough to get my small job done quickly and fairly effortlessly, but without the collateral damage larger sanding tools often leave in their wake. One quick sweep with my vacuum, and you wouldn’t have known I had just sanded down a sizable portion of my living room (I was so enthralled with the ease of use with the Velocity that I actually spackled more spaces in the living room and took the tool to task.). A project that usually would have taken, by hand, a number of hours and a fair amount of anit-inflammatories later used up maybe thirty minutes of my Saturday morning, give or take. The wood and drywall blade will most likely be my next foray into the power of this oscillating tool — and with the handy storage bag, it’s incredibly easy to pack everything together for quick and easy (and dirty) projects. I think the Velocity is a great tool for the moderately to highly experienced DIYer to add to their toolbox or workspace — it performs the tasks of several tools all rolled into one, and with the ease and precision that the Dremel brand is known for. Stay tuned for part two of this review in the coming weeks!